Sean Dyche isn’t going to press the panic button, amid Burnley’s worst start to a Premier League season. The Clarets sit 17th in the table, but only a point above bottom side Fulham, after claiming only two wins – and nine points - from their opening 13 games. 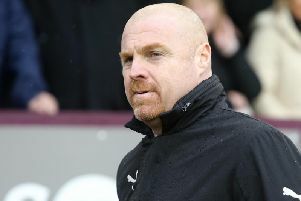 In both Burnley’s Premier League relegation seasons, they had more points on the board after 13 fixtures, 15 under Owen Coyle in 2009/10, and 11 in 2014/15 under Dyche . But, ahead of Saturday’s trip to Crystal Palace, Dyche is focusing on putting in a performance, paying no attention to the league table. He said: “The most important thing about the League table is after the last game of the season. “I’ve been saying that six years, because we’ve been promoted, stayed in the Premier League, been in Europe, that’s the important day, the second the final whistle goes on the last day. “The rest of it is just noise, performances get you wins, that’s the key over a season. Things don’t get any easier after the game at Selhurst Park, with Liverpool, Spurs and Arsenal to come, along with a home game against Brighton, but Dyche countered: “You’ve got to play everyone home and away, I know it’s a bit of a boring story, but last season we didn’t win for 11 games, the noise is only different because we were higher up the table. “But we came out of that and won five on the trot, so there’s not many times you’ll see me up here panicking. Newcastle claimed a third-successive win on Monday at Turf Moor, having failed to win in their first 10 games, and Dyche noted: “That can be the madness of football, we cane out of a tricky spell, won two and drew one, that can be it, but you have to earn the right. But Ben Gibson was back on the bench, and there are other players closing in on a return to fitness: “Ben’s had a frustrating time and he’ll look forward to coming back to full fitness, Tarky is getting back, Wardy is on his way back, a bit further, Popey is on his way back.